Caption: Wits Tang Soo Do club members pose at the end of the tournament. 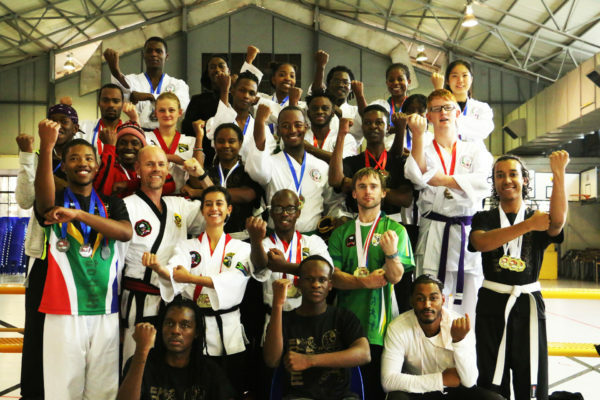 WITS Tang Soo Do club won a total of 60 medals at the annual Combat Tang Soo Do SA Championship that took place on Saturday, April 13 at Wits’ Hall 29. Various teams of different age groups from six provinces – Mpumalanga, Gauteng, Free State, Western Cape, Eastern Cape and North West – competed at the national championship for the karate-based Korean martial art. The contestants competed in sparring, traditional and modern form as well as short and long weapon. Gauteng won a total of 105 medals out of 285, thanks mainly to the Wits club’s 21 gold, 23 silver and 16 bronze medals out of the 105. This was an improvement on the team’s total of 32 medals last year. Wits coach Gregory Hart and one of the event’s organisers told Wits Vuvuzela that the club had done well in the past and had been club of the year for the past two years. “Our students have managed to excel in both their studies and sports…healthy body, healthy mind,” said Hart. “It was a very successful tournament. As a team we really worked hard together to bring the tournament to life,” said chairperson of Wits Tang Soo Do Anushka Monema, 20. Susan Mwaniki, who is also 20, joined the club this year and was anxious about competing. However, she went on to win a gold medal for sparring and a silver medal for the traditional form. “I was nervous because it was my first time competing. I was also proud of myself for trying out something new and excelling in it,” Mwaniki told Wits Vuvuzela. Tanita Ramburuth-Hurt, 25, who is studying towards an MSc in astrophysics, was the only person to walk away with six gold medals at the championship. A black belt-in-training, Ramburuth-Hurt told Wits Vuvuzela that she was one of the few participants who had been doing Tang Soo Do for a long time. “I have learned what the judges are looking for in terms of form and I have learned how to handle the nerves, which is what a lot of people are struggling with,” she said. The club will use the R2060 it got from the entrance fee and commission from the catering company, to fund its travel outside Gauteng, according to Monema.